2. Transforming the Preparation of Physics Teachers: A Call to Action. A Report by the Task Force on Teacher Education in Physics (T-TEP), edited by David E. Meltzer, Monica Plisch, and Stamatis Vokos (American Physical Society, College Park, MD, 2012), 126 pages. 1. Teacher Education in Physics: Research, Curriculum, and Practice, edited by David E. Meltzer and Peter S. Shaffer (American Physical Society, College Park, MD, 2011), 189 pages. 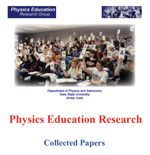 Physics Education Research: Collected Papers, all papers published by the Iowa State University Physics Education Research Group. 24. Valerie K. Otero and David E. Meltzer, The past and future of physics education reform, Physics Today 70(5), 50-56 (2017). 23. Valerie K. Otero and David E. Meltzer, A discipline-specific approach to the history of U.S. science education, Journal of College Science Teaching 46, 34-39 (2017). 22. Valerie K. Otero and David E. Meltzer, 100 years of attempts to transform physics education, The Physics Teacher 54, 523-527 (2016). 21. David E. Meltzer and Valerie K. Otero, A brief history of physics education in the United States, American Journal of Physics 83, 447-458 (2015). 20. Benjamin W. Dreyfus, Benjamin D. Geller, David E. Meltzer, and Vashti Sawtelle, Resource Letter TTSM-1: Teaching Thermodynamics and Statistical Mechanics in Introductory Physics, Chemistry, and Biology, American Journal of Physics 83, 5-21 (2015). 19. David E. Meltzer and Valerie K. Otero, Transforming the preparation of physics teachers [guest editorial], American Journal of Physics 82, 633-637 (2014). 18. David E. Meltzer and Ronald K. Thornton, Resource Letter ALIP-1: Active-Learning Instruction in Physics, American Journal of Physics 80, 478-496 (2012). 17. Warren M. Christensen, David E. Meltzer, and Ngoc-Loan P. Nguyen, Student understanding of calorimetry in introductory calculus-based physics, American Journal of Physics 79, 1168-1176 (2011). 16. Warren M. Christensen, David E. Meltzer, and C. A. Ogilvie, Student ideas regarding entropy and the second law of thermodynamics in an introductory physics course, American Journal of Physics 77, 907-917 (2009). 15. David E. Meltzer, Investigating and addressing learning difficulties in thermodynamics, Proceedings of the American Society for Engineering Education 2008 Annual Conference and Exposition, July 22-25, 2008. 14. David E. Meltzer, Analysis of shifts in students’ reasoning regarding electric field and potential concepts, 2006 Physics Education Research Conference [Syracuse, New York (USA), 26-27 July 2006], edited by Laura McCullough, Leon Hsu, and Paula Heron [American Institute of Physics Conference Proceedings 883, 177-180 (2007)]. 13. Ngoc-Loan Nguyen and David E. Meltzer, Visualization tool for 3-D relationships and the right-hand rule, The Physics Teacher 43, 155-157 (2005). 12. David E. Meltzer, Relation between students’ problem-solving performance and representational format, American Journal of Physics 73, 463-478 (2005). 11. Paula R. L. Heron and David E. Meltzer, Guest Editorial--The Future of Physics Education Research: Intellectual Challenges and Practical Concerns, American Journal of Physics, 73, 390-394 (2005). 10. David E. Meltzer, Investigation of students’ reasoning regarding heat, work, and the first law of thermodynamics in an introductory calculus-based general physics course, American Journal of Physics 72, 1432-1446 (2004). 9. Thomas J. Greenbowe and David E. Meltzer, Student learning of thermochemical concepts in the context of solution calorimetry, International Journal of Science Education 25, 779-800 (2003). 8. Ngoc-Loan Nguyen and David E. Meltzer, Initial understanding of vector concepts among students in introductory physics courses, American Journal of Physics 71, 630-638 (2003). 7. David E. Meltzer, The relationship between mathematics preparation and conceptual learning gains in physics: a possible “hidden variable” in diagnostic pretest scores, American Journal of Physics 70, 1259-1268 (2002). 6. David E. Meltzer and Kandiah Manivannan, Transforming the lecture-hall environment: The fully interactive physics lecture, American Journal of Physics 70, 639-654 (2002). 5. Laura McCullough and David E. Meltzer, Differences in male/female response patterns on alternative-format versions of FCI items, Proceedings of the Physics Education Research Conference, Rochester, New York, July 25-26, 2001, edited by Scott Franklin, Jeffrey Marx, and Karen Cummings (Rochester, New York, 2001), pp. 103-106. 4. Kandiah Manivannan and David E. Meltzer, Use of in-class physics demonstrations in highly interactive format, Proceedings of the Physics Education Research Conference, Rochester, New York, July 25-26, 2001, edited by Scott Franklin, Jeffrey Marx, and Karen Cummings (Rochester, New York, 2001), pp. 95-98. 3. David E. Meltzer, Student reasoning regarding work, heat, and the first law of thermodynamics in an introductory physics course, Proceedings of the Physics Education Research Conference, Rochester, New York, July 25-26, 2001, edited by Scott Franklin, Jeffrey Marx, and Karen Cummings (Rochester, New York, 2001), pp. 107-110. 2. David E. Meltzer and Amy Woodland Espinoza, Guided inquiry: Let students "discover" the laws of physics for themselves, Science Scope 21 (2), 28-31 (October 1997). 1. David E. Meltzer and Kandiah Manivannan, Promoting interactivity in physics lecture classes, The Physics Teacher 34, 72-76 (1996). 5. David E. Meltzer, lead author, Resources for the education of physics teachers, in David E. Meltzer, Monica Plisch, and Stamatis Vokos, editors, Transforming the Preparation of Physics Teachers: A Call to Action. A Report by the Task Force on Teacher Education in Physics (T-TEP) (American Physical Society, College Park, MD, 2012), pp. 83-123. 4. David E. Meltzer, lead author, Foundational material II: Research on physics teacher education, in David E. Meltzer, Monica Plisch, and Stamatis Vokos, editors, Transforming the Preparation of Physics Teachers: A Call to Action. A Report by the Task Force on Teacher Education in Physics (T-TEP) (American Physical Society, College Park, MD, 2012), pp. 37-39. 3. David E. Meltzer, lead author, Foundational material I: Historical context, in David E. Meltzer, Monica Plisch, and Stamatis Vokos, editors, Transforming the Preparation of Physics Teachers: A Call to Action. A Report by the Task Force on Teacher Education in Physics (T-TEP) (American Physical Society, College Park, MD, 2012), pp. 29-36. 2. David E. Meltzer, Research on the education of physics teachers, in Teacher Education in Physics: Research, Curriculum, and Practice, edited by David E. Meltzer and Peter S. Shaffer (American Physical Society, College Park, MD, 2011), pp. 3–14. 1. David E. Meltzer, Enhancing active learning in large-enrollment physics courses, invited chapter in Preparing Future Science and Mathematics Teachers, edited by Diane Smith and Elisabeth Swanson (Science Math Resource Center, Montana State University, Bozeman, MT, 2005), pp. 49-52. 19. David E. Meltzer, Monica Plisch, and Stamatis Vokos, The role of physics departments in high school teacher education, APS News 22(8), 8 (2013). 18. David E. Meltzer, Observations of General Learning Patterns in an Upper-Level Thermal Physics Course, in 2009 Physics Education Research Conference [Ann Arbor, Michigan (USA), 29-30 July 2009], edited by Mel Sabella, Charles Henderson, and Chandralekha Singh [American Institute of Physics Conference Proceedings 1179, 31-34 (2009)]. 17. David E. Meltzer, Non-Traditional Methods of Publication, American Physical Society Forum on Education Newsletter, Spring 2008, pp. 4-6. 16. David E. Meltzer, Formative Assessment Materials for Large-Enrollment Physics Lecture Classes, in Assessment of Student Achievement: Proceedings of the National STEM Assessment Conference [Science, Technology, Engineering, and Mathematics], October 19-21, 2006, Washington, D.C., edited by Donald Deeds and Bruce Callen [Drury University, 2007], pp. 173-189. 15. David E. Meltzer, Investigation of Student Learning in Thermodynamics and Implications for Instruction in Chemistry and Engineering, in 2006 Physics Education Research Conference [Syracuse, New York (USA), 26-27 July 2006], edited by Laura McCullough, Leon Hsu, and Paula Heron [American Institute of Physics Conference Proceedings 883, 38-41 (2007)]. 14. Warren Christensen and Larry Engelhardt, Tapping Physics Education Research for a Graduate-Level Curriculum: A Novel Approach for a Ph.D. Qualifying Exam Preparation Course, American Physical Society Forum on Education Newsletter, Spring 2006, pp. 7-15. 13. Paula Heron and David Meltzer, Lobbying for Discipline-based Education Research, American Physical Society Forum on Education Newsletter, Fall 2005, pp. 14-16. 12. Paula R. L. Heron and David E. Meltzer, Chemical Education and Physics Education: Facing Joint Challenges and Practical Concerns, CHED Newsletter [published by the Division of Chemical Education, American Chemical Society], Fall 2005, pp. 35-37. 11. David E. Meltzer, Investigation of Student Reasoning Regarding Concepts in Thermal Physics, American Physical Society Forum on Education Newsletter, Spring 2005, pp. 4-5. 10. David E. Meltzer, Student Learning in Upper-Level Thermal Physics: Comparisons and Contrasts with Students in Introductory Courses, 2004 Physics Education Research Conference [Sacramento, California, 4-5 August 2004], edited by Jeffrey Marx, Paula R. L. Heron, and Scott Franklin [American Institute of Physics Conference Proceedings 790, 31-34 (2005)]. 9. David E. Meltzer, How Do You Hit A Moving Target? Addressing the Dynamics of Students’ Thinking, 2004 Physics Education Research Conference [Sacramento, California, 4-5 August 2004], edited by Jeffrey Marx, Paula R. L. Heron, and Scott Franklin [American Institute of Physics Conference Proceedings 790, 7-10 (2005)]. 8. David E. Meltzer, Mini-Course on Physics Education Research and Research-Based Innovations in Physics Instruction, Memorias del XII Taller Internacional: Nuevas Tendencias en la Enseñanza de la Física [Proceedings of the XII International Workshop: New Trends in Physics Teaching], Puebla, Mexico, May 27-30, 2004, edited by Josip Slisko, Cupatitzio Ramírez, and Adrián Corona (Benemérita Universidad Autónoma de Puebla, Faculdad de Ciencias Físico Matemáticas, Cuerpo Académico de Investigación Educativa, Puebla, Mexico, 2004), pp. 28-35. 7. David E. Meltzer, The Questions We Ask and Why: Methodological Orientation in Physics Eduaction Research, 2003 Physics Education Research Conference [Madison, Wisconsin, 6-7 August 2003], edited by Jeffrey Marx, Scott Franklin, and Karen Cummings [American Institute of Physics Conference Proceedings 720, 11-14 (2004)]. 6. David E. Meltzer, Issues Related to Data Analysis and Quantitative Methods in PER, Proceedings of the 2002 Physics Education Research Conference [Boise, Idaho, August 7-8, 2002], edited by Scott Franklin, Karen Cummings, and Jeffrey Marx (New York, PERC Publishing, 2002), pp. 21-24. 4. David E. Meltzer, Student Learning of Physics Concepts: Efficacy of Verbal and Written Forms of Expression in Comparison to Other Representational Modes, paper presented at the Conference on Ontological, Epistemological, Linguistic and Pedagogical Considerations of, Language and Science Literacy: Empowering Research and Informing Instruction, University of Victoria, Victoria, British Columbia, Canada, September 13, 2002. 2. David E. Meltzer, Iowa State University is New Entrant into Physics Education Research Community, American Physical Society Forum on Education Newsletter, Summer, 1999, pp. 12-13. 1. David E. Meltzer, “Micro-Document” for National Science Foundation Teacher Education Workshop, paper prepared for the National Science Foundation workshop “Teacher Education: From Preparation to Practice,” Washington, D.C., May 7-8, 1999. 2. David E. Meltzer, Nontraditional Approach to Algebra-based General Physics [Presentation at the International Conference on Undergraduate Physics Education, College Park, Maryland, August 1, 1996]; In: The Changing Role of Physics Departments in Modern Universities: Proceedings of the International Conference on Undergraduate Physics Education, edited by Edward F. Redish and John S. Rigden (AIP Conf. Proc. 399, American Institute of Physics, Woodbury, New York, 1997), Part One, pp. 823-825. 1. David E. Meltzer, Lillian C. McDermott, Paula R. L. Heron, Edward F. Redish, and Robert J. Beichner, A Call to the AAPT Executive Board and Publications Committee to Expand Publication of Physics Education Research Articles within the American Journal of Physics, report to the American Association of Physics Teachers, revised December 29, 2003.